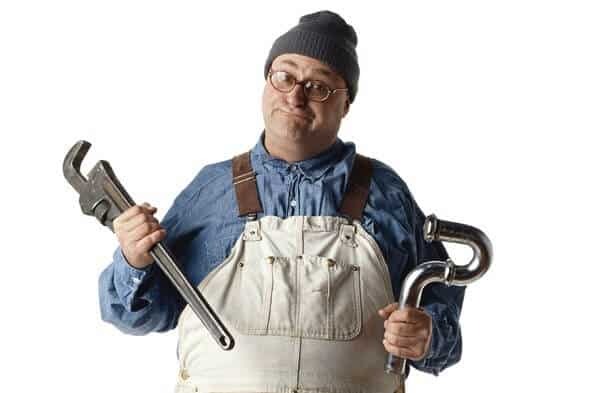 Need plumbing repair, sewer repair, or sewer welding in NJ? At A1 Sewer & Drain Services, we provide timely, reliable plumbing pipe repair, drainage pipe repair, and sewer repair in NJ. We’re always available for same-day service in New Jersey , sewer repair services with fast response times from experienced local NJ plumbers. We fix plumbing of all kinds, from small household water pipes to massive municipal water mains in Bergen County and all over NJ. Although we specialize in fixing underground water pipes, we provide a full range of local plumbing services in NJ. For 24-hour emergency sewer repair or plumbing repairs in NJ, call us anytime at A1 Sewer & Drain Services, at 201-645-0888. Many homes and commercial buildings in New Jersey are outfitted with copper plumbing pipes. Copper is durable, nontoxic, and have a long history of reliable use. Up until the 1970s, all hot water and cold water plumbing pipes in New Jersey were made from copper. Even today, it’s used in 85% of US homes. It’s low-maintenance, it’s biostatic, and it actually inhibits the growth of bacteria that could be harmful for human health. 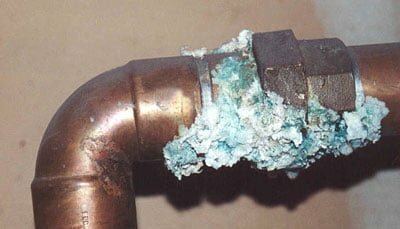 Like anything, though, copper plumbing pipes can break, leak, or otherwise become damaged. Even a small water leak can quickly cause significant water damage, so it’s important to get professional plumbing pipe repair in NJ as soon as possible. Loose joints, corrosion, or freezing can cause your copper water pipes to leak; this also applies to copper sewer pipes. Copper plumbing pipe repairs generally require a process known as soldering. This welding process uses a fusible metal alloy to permanently bond two pieces of metal. 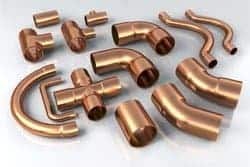 There are ways to fix copper pipes without soldering, such as SharkBite fittings, but soldering by professional plumbers provides the most reliable results. 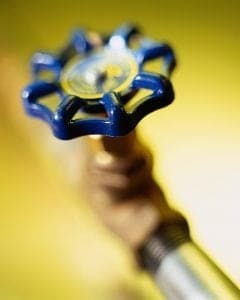 Naturally, pipes that carry potable water must be repaired with lead-free solder. Cutting the copper with a tube cutter. Tube cutters work well to cut copper, which is actually a relatively soft metal. The cutting will create a “burr,” an area where copper has been forced inward into a ridge by the cutting wheel. This ridge could obstruct water flow through the pipe, so it needs to be removed with a reaming attachment. Cleaning the cut pipe. Dirt and corrosion can be cleaned off of the pipe, ensuring a successful repair. Professional plumbers in NJ generally use 120-grit emery cloth. Cleaning the fittings with a wire brush. Once the mating surfaces have been cleaned off, the surfaces must be coated with flux. Flux is an acidic paste that chemically etches the copper pipe. Fluxing the pipe joints. Both the pipe ends and the insides of fittings will need to be coated with flux. Heating the joint. Propane torches are used to heat the joint evenly, allowing the solder to melt and flow into the joint. For fixing broken copper plumbing pipes, getting a professional plumber to use professional soldering tools is the best option. For plumbing pipe repair in NJ, including 24-hour emergency service, you can call us anytime at A1 Sewer & Drain Services. Joining segments of PVC pipe for sewer welding in NJ is quite a different process than using soldering to join copper plumbing pipes. PVC “welding” actually uses a compound called solvent cement, instead of metal solder, to join pipe pieces together into a single unit. Solvent cement for PVC sewer welding is a combination of solvents and plastic resins. It comes in several grades, from “regular body” with a consistency similar to cooking oil, to “heavy body” for larger pipes that’s more viscous, with a thickness comparable to honey. The solvent cement causes the plastic pipe and joints to soften and swell. After the solvent evaporates, the pieces are joined. Afterward, resin can be used to fill in any gaps, preventing water leaks. Solvent cement PVC sewer welding is surprisingly strong, resisting high temperatures and pressures. Need sewer pipe repair or household plumbing pipe repair in New Jersey? 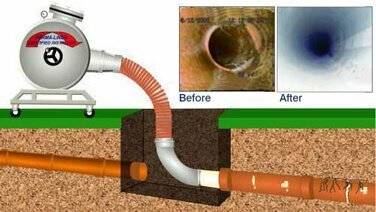 At A1 Sewer & Drain Services, our experienced NJ plumbers are highly trained in the latest techniques for effective, reliable repairs for metal and PVC pipes. For service today, call us anytime at 201-645-0888.